Gary David Cohn (born August 27, 1960) is an American investment banker and political figure. He is the chief economic advisor to President Donald Trump and Director of the National Economic Council. He was formerly the president and chief operating officer of Goldman Sachs from 2006 to 2017. Cohn is a registered Democrat, but has donated extensively to Republican politicians as well. Cohn was thought to be one of the most influential voices in the Trump administration. On March 6, 2018, it was reported that Cohn planned to resign from his position in the coming weeks. ↑ Ruben, Greg. "Inside Trump World". Axios. ↑ "Trump to name Goldman Sachs veteran, Gary Cohn, to head National Economic Council". The Washington Post. December 9, 2016. ↑ Soergel, Andrew (December 9, 2016). "Goldman Sachs President Offered Top National Economic Council Job". US News. Retrieved December 9, 2016. ↑ Campbell, Dakin; Jacobs, Jennifer (2016-11-29). "Trump Meets With Goldman's Cohn as Dinner Set With Romney". Bloomberg.com. (see 3rd+4th paragraph after sub-headline "Goldman Carrier"). Archived from the original on 2016-11-29. Retrieved 2017-04-20. 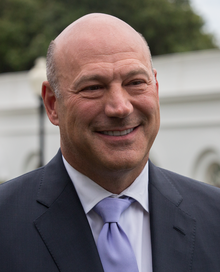 ↑ "Gary Cohn - $68,642 in Political Contributions for 2016". www.campaignmoney.com. (2016 cycle selected by default, other campaign cycles choosable). Retrieved 2017-04-20. ↑ Paletta, Damian (April 13, 2017). "Within Trump's inner circle, a moderate voice captures the president's ear". The Washington Post. ↑ Kelly, Kate; Haberman, Maggie (March 6, 2018). "Gary Cohn to Resign as Trump's Top Economic Adviser". The New York Times. Retrieved March 6, 2018. This page was last changed on 13 April 2018, at 08:08.